On this day in 1970, Charles "Sonny" Liston beat up Chuck Wepner and stopped him after nine bloody rounds at the Jersey City Armory. At the time, it appeared that Liston was just rebounding from his surprise loss of six months prior to Philly's Leotis Martin. 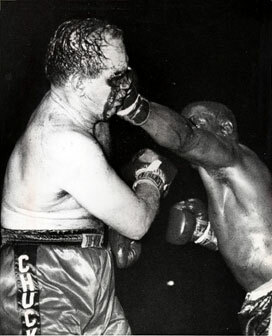 However, this stoppage of Wepner, the "Bayonne Bleeder", turned out to be Sonny Liston's very last ring appearance. Six months later, he was found dead in his Las Vegas home. The fight started with a surprise. Wepner nailed the former champ with a straight right and Liston's knees buckled. Thoughts of his last outing, the KO loss at the hands of Martin, must have flooded his mind. But he stayed upright and kept fighting. By round number three, Liston had the 'Bleeder' bleeding from a cut over his right eye. It was the first of six gashes that Liston would administer. In round five, he dropped the 30 year old Wepner, who got up and fought on gamely, trying to do something against his methodical foe. By the seventh round, Wepner's left eye was almost completely shut. An underdog going into the fight, Wepner's chances of winning appeared to be getting even worse. After a couple more rounds-worth of punishment by Liston, the bout was mercifully stopped by the ringside doctor, Reginald Farrar, between rounds nine and ten. The result went into the books as a TKO 10, and raised Sonny's record to 50-4 with 39 KOs. It would be his final tally. Five years later, Wepner would go on to lose even more famously to Muhammad Ali in a spirited challenge for the heavyweight title that inspired a then-unknown Sylvester Stallone to create the Rocky Balboa character.